Adding borders to highlight pictures, tables or documents can really make your content stand out. Same goes with the text in your Word documents. You can choose to border individual words, lines, or even whole paragraphs. Just how plain or fancy you want to make those borders is up to you. Click Home > Borders > the arrow next to Borders. 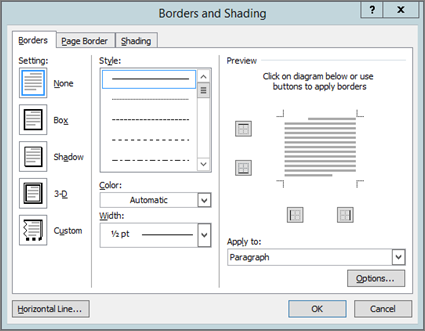 Choose the type of border you want. You can change the border around your text at any time or you can add, change, or delete borders from documents or pictures.